For patients who suffer from pain and issues caused by sciatica or herniated discs, this new addition will provide superior results by providing additional relief, delivered deep into the affected tissue. LightForce® FX treatments will be included with spinal decompression treatments beginning immediately. 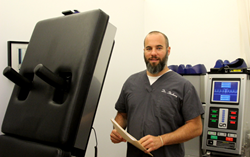 Dr. Steven Shoshany, one of NYC's leading chiropractors and a pioneer in the field of non-surgical spinal decompression, is pleased to announce the introduction of deep tissue laser technology to his practice, specifically the LightForce® FX user-dynamic system. By combining his patented non-surgical spinal decompression protocol with Lightforce® FX technology, Dr. Shoshany can offer his patients a new level of relief for symptoms of pain and inflammation caused by spinal disorders or injuries. Non-surgical spinal decompression is at the core of Dr. Shoshany's chiropractic and physical rehabilitation practice. In the late 1990s, when Dr. Shoshany's practice first began operations, he was one of the first chiropractors in NYC to offer patients this revolutionary treatment. Over the years, Dr. Shoshany has helped scores of patients successfully heal from pain, discomfort, and impaired motion due to spinal issues. At the same time, Dr. Shoshany's patients have experienced lasting pain relief while avoiding sometimes risky surgical procedures and the use of painkillers, all thanks to spinal decompression. Now, two decades after the introduction of spinal decompression to Dr. Shoshany's practice, the highly successful treatment protocol is getting a high-tech upgrade in the form of LightForce® FX. For patients who suffer from pain and issues caused by sciatica or herniated discs, this new addition will provide superior results by providing additional relief, delivered deep into the affected tissue. LightForce® FX treatments will be included with spinal decompression treatments beginning immediately, for all patients who qualify . The benefits of LightForce® FX deep tissue laser include faster healing, enhanced comfort, and future injury prevention. This highly effective, non-invasive treatment protocol works at the cellular level, deep inside the affected tissue, by promoting cellular regeneration and assisting in the production of ADP, also known as "cellular fuel." LightForce® FX is a user-dynamic system that is automatically personalized to the needs of each patient, and is updated as treatment progresses and the patient's condition evolves. The deep tissue treatment's effectiveness can be monitored using the device's high-definition screen, which also serves as a patient education tool, explaining each step of the process in real time, so that patients can have a deep understanding of the treatment they are undergoing. For additional information on non-surgical spinal decompression enhanced with LightForce® FX deep tissue laser, please visit Dr. Shoshany's website. Dr. Shoshany's state-of-the-art physical rehabilitation facility is located in downtown NYC, at 632 Broadway.